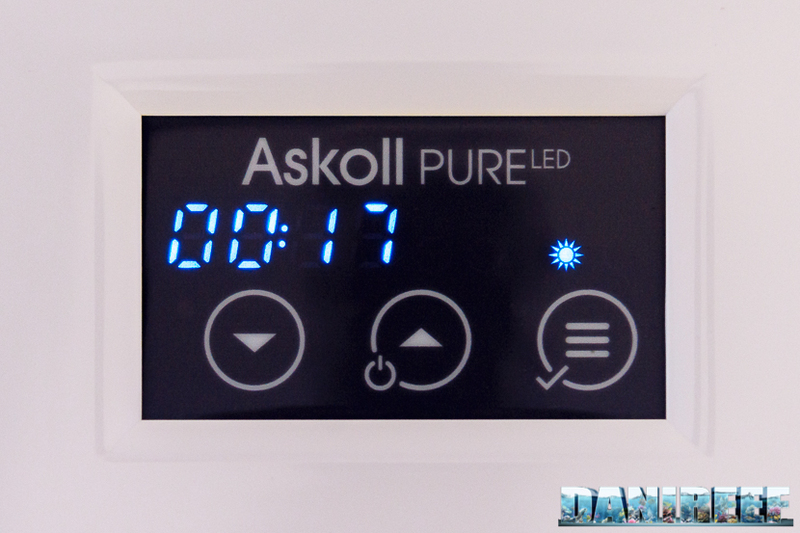 Askoll Pure Marine XL HC Led is a complete and compact marine aquarium ready to use, an All In One as they say nowadays. I must confess that when we talk about Askoll I’m partial, because my aquaristic life was born in the last century with an Askoll Tenerife 65. We have come a long way since that day. Let’s see all the details of this new tank. 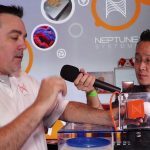 We can split marine aquarium setups into two categories. The first one is the systems that are built starting with the glasses and then buying all the accessories required, e.g. the cabinet, the technical equipment, the lights, and so on. 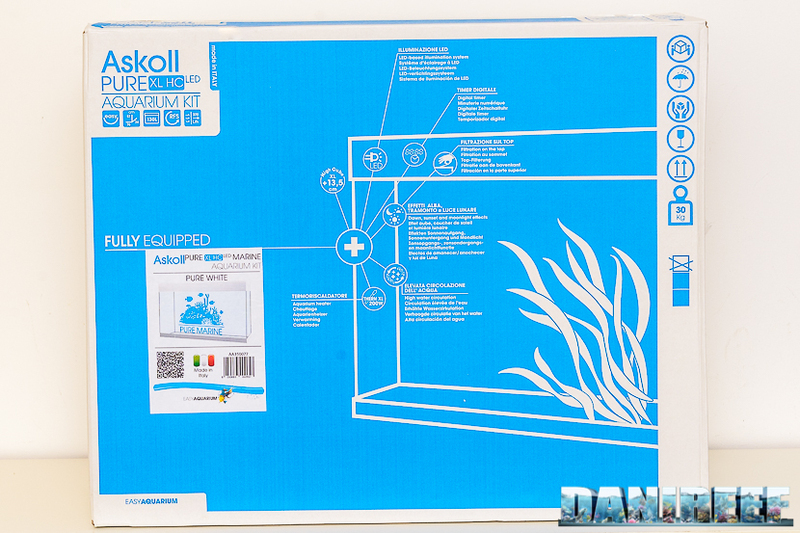 On the other hand we have the All in One aquariums, which are ready to use rigt out of their box. 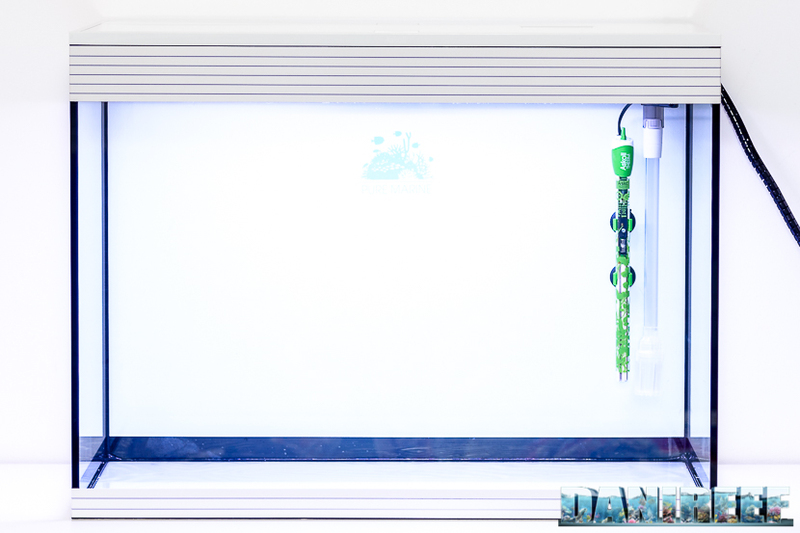 Askoll Pure Marine XL HC LED is in that second category of aquariums. 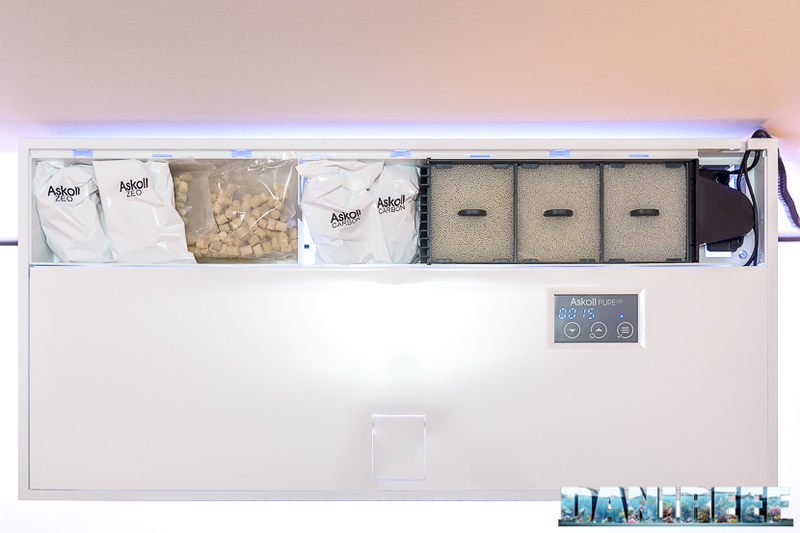 A complete aquarium, compact, plug and play, and ready to use. It has almost everything that it needs to work properly. Let’s see it in detail and then we’ll give you some tips to keep it running at the top of its game. Price: between 350 and 400 euros ($398 to $455 USD). This is a pretty well-rounded aquarium. 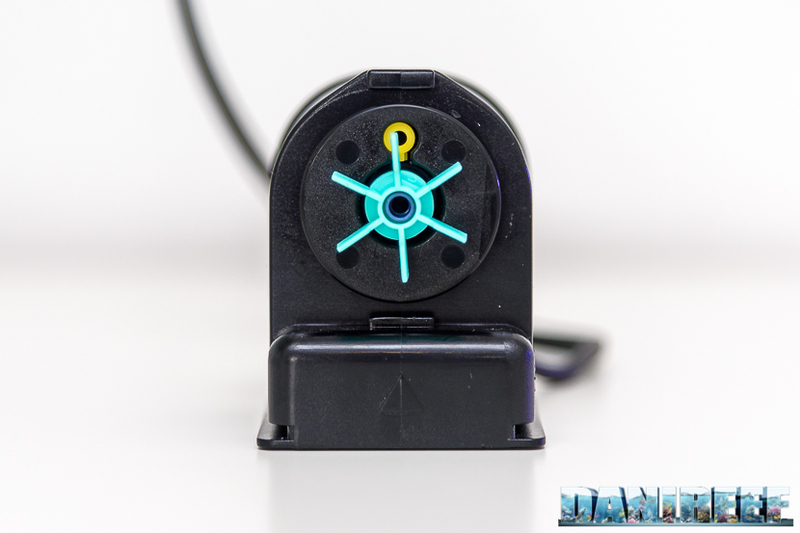 There is a LED lighting system provided with its own timer, a filter with pump, and as you can see from the pictures, it comes with filter materials for the initial set-up. These materials are mechanical sponges, zeolite, carbon, and ceramic elements. A heater is provided too. The only thing missing to make it a real marine aquarium is a couple of 650-1,300 l/h movement pumps, depending on what we want to breed. 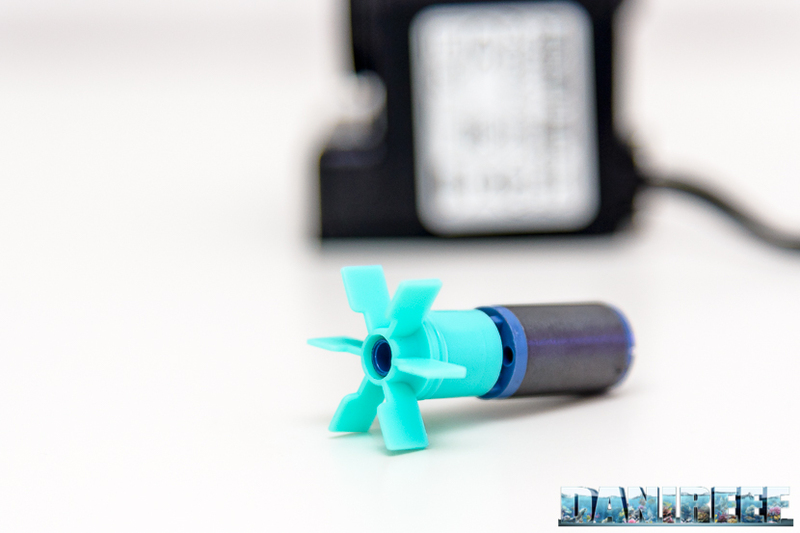 We have written several reviews on these pages; check out our propeller pumps dedicated area here. 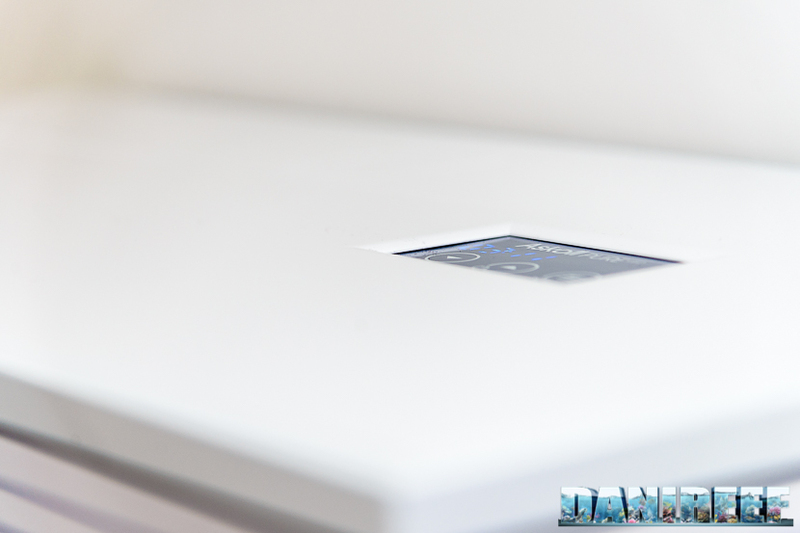 The external size of the tank is 76x36x57 cm; given the glass thickness and the place on the top for the filter and lighting system, it means an internal volume of 130 liters. My congratulations to Askoll that declares the real volume of the tank and not, as most companies do, the external volume, which would be much higher (about 156 litres). One of the innovations of this wonderful marine aquarium is the lighting system; it abandoned neons in favor of the well over efficient LED. 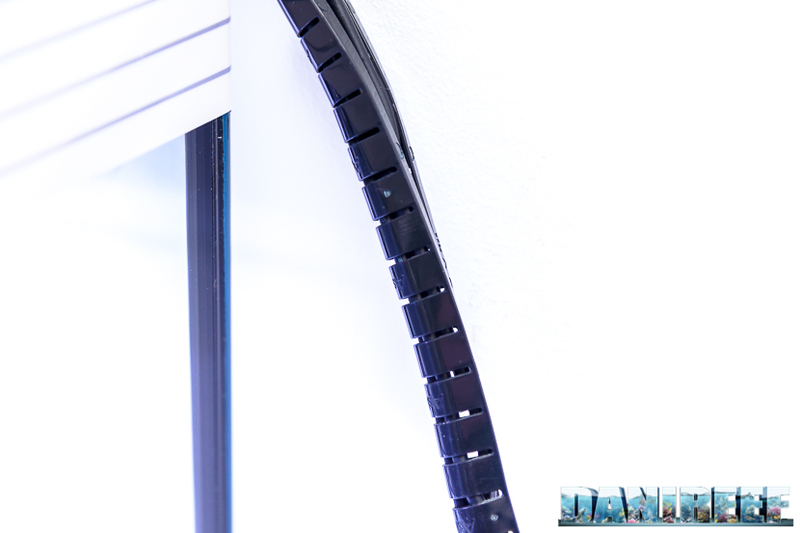 In this aquarium we have a 25 watt LED bar with 60 white LEDs, 8 red and 20 actinic blue. 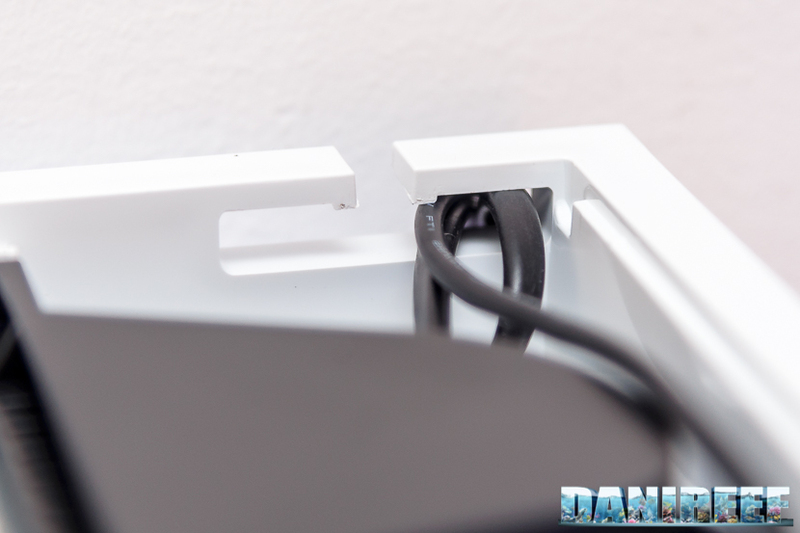 The system has a built-in timer that allows different switching-on of the LEDs in two channels. 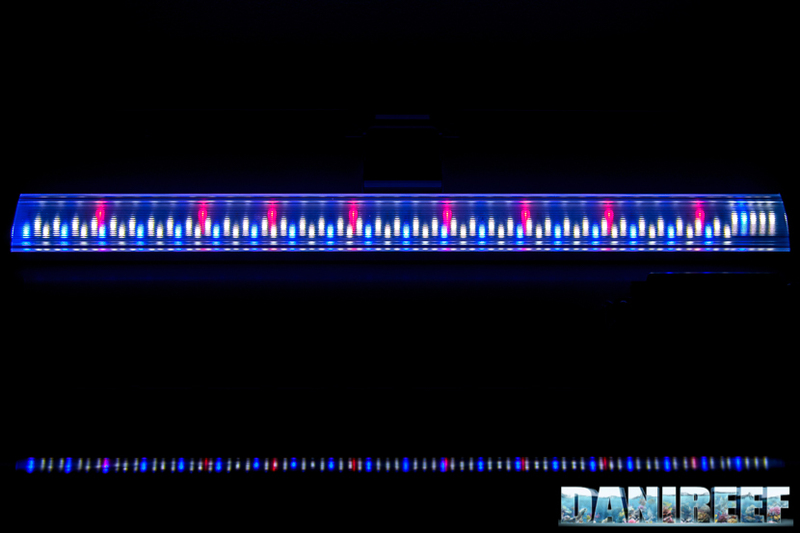 The first channel turns on white and red, and the second one turns on the blue. Above we see the timer, which consists of a touch screen display with three buttons. Operating it is quite simple. 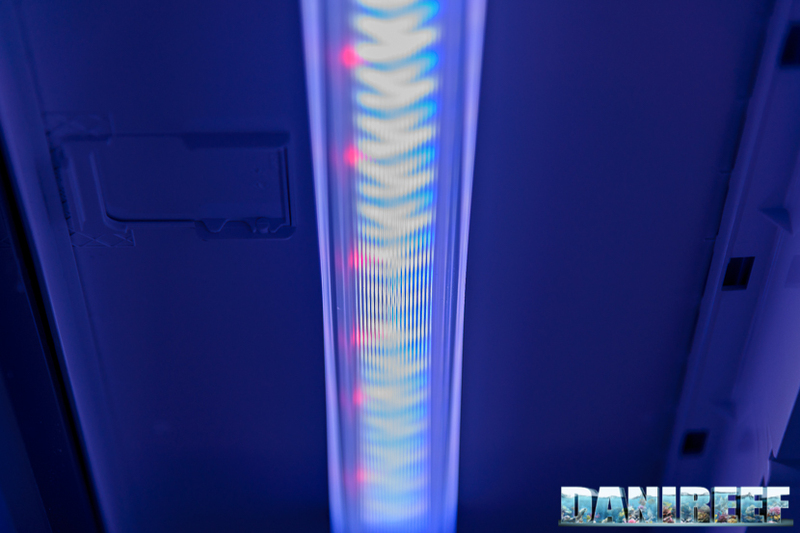 Once you set the time and the lighting timetable, the blue channel of the LED bar will turn on two hours before the established time. In this case, dawn mode is activated and it takes the blue channel from zero to 100% in half an hour, then goes on with the blue only for one hour and a half. After the time set, the white channel will turn on, with the same logic, and in half an hour white and red turn on from 0 to 100%. 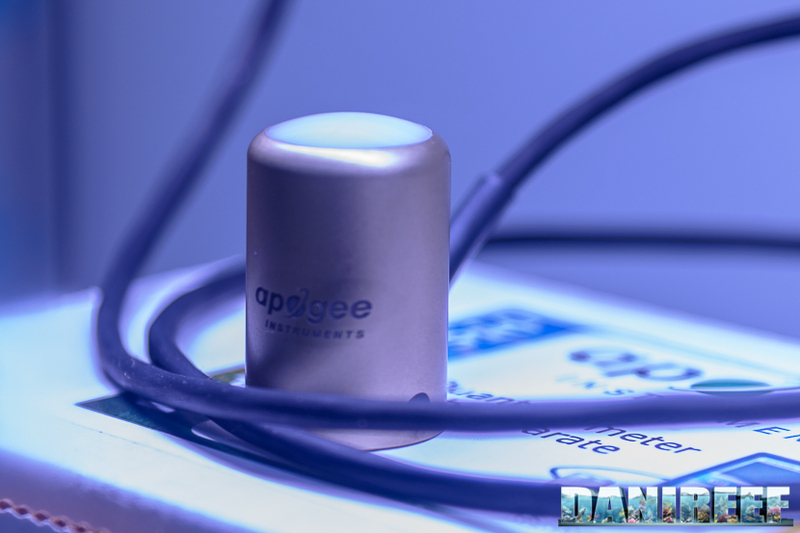 At the time set for the switch-off, it start dimming white and red for 30 minutes, and after one hour and a half, the blue will turn off in 30 minutes. A nice addition is the self-disconnecting display that turns off when not in use for a long time, and it is restored by pressing the three buttons together. 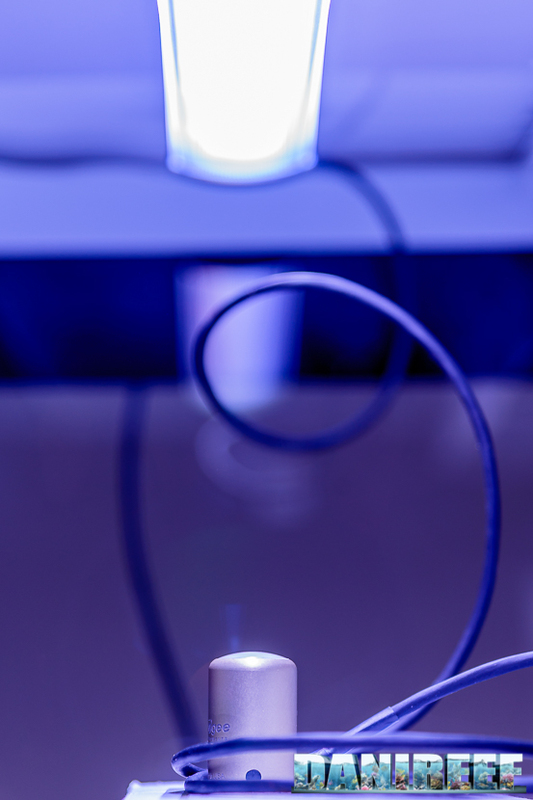 We know that lighting is essential to manage a marine aquarium, so we made some measurements with our equipment. 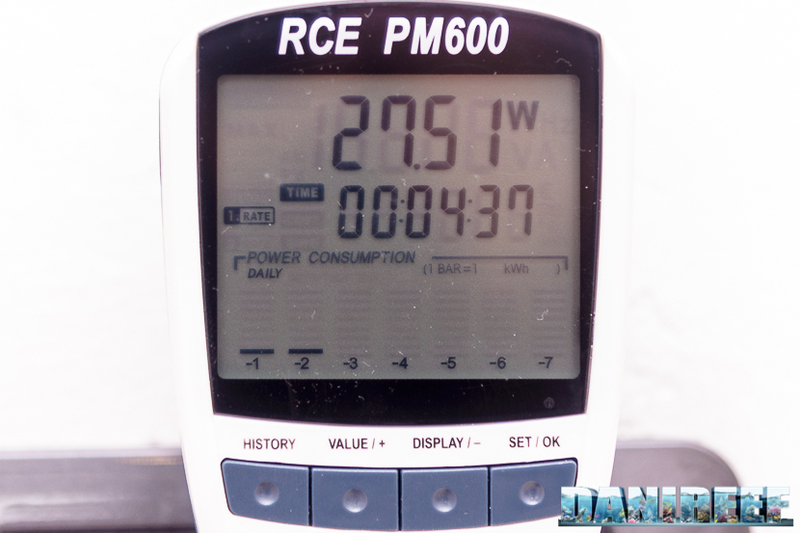 The detection of the instant consumption of the LED bar was made possible thanks to the instrument RCE PM600. The result is given in Watts. We also measured the consumption with only the blue channel on. The value detected is good. In line with what Askoll declares, with only a 10% difference that could be explained thanks to a voltage difference during the test. 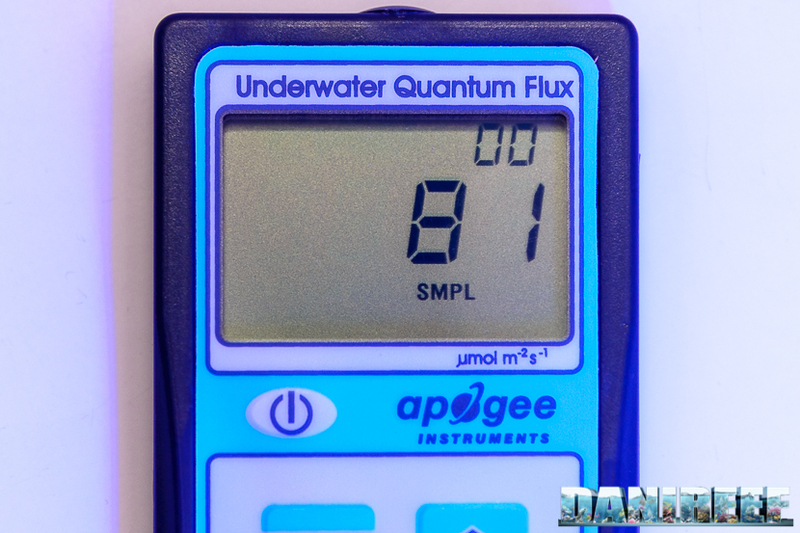 Things got interesting when we measured the PAR value, expressed in PPFD (photosynthetic photon flux density) in μmol m-2 s-1 with the best instrument on the market, the Quantum Meter MQ-510 by Apogee. 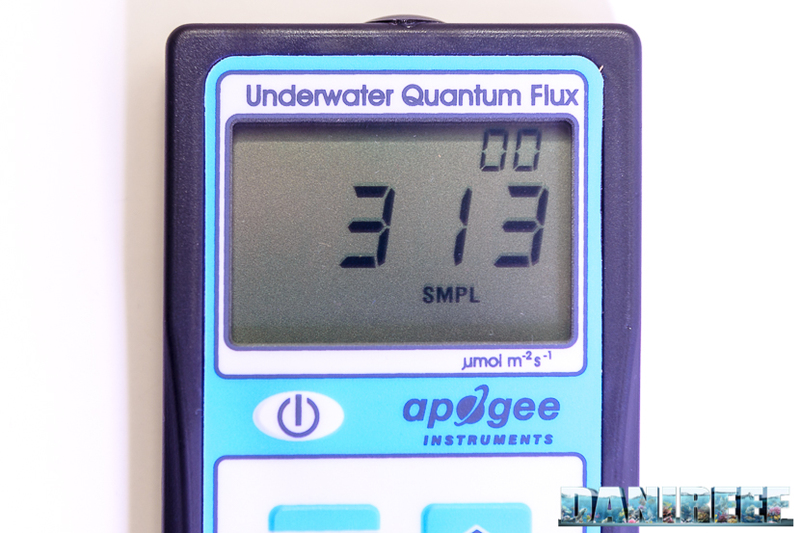 This device is calibrated to work underwater, so when it is used in the air, the resulting value must be divided by 1.32, which is the correction factor of immersion. We didn’t have water when we made our test, so we have to make the conversion. Blue channel: 61 μmol m-2 s-1. We can see that the white-red channel gives 237/27.5=8.6 μmol m-2 s-1 per watt, while the blue channel provides 81/8.3=7.3 μmol m-2 s-1 per watt. 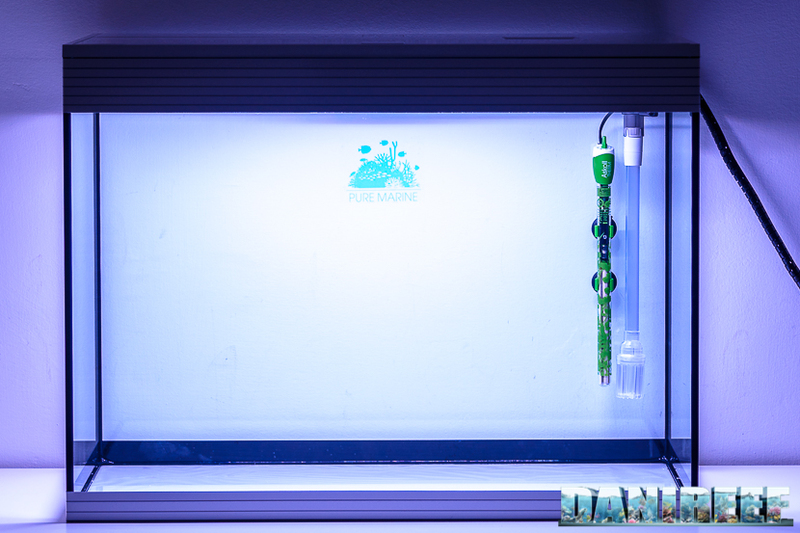 With these detected values, in the middle of the LED bar, at a 20 cm distance in the air, we are sure that it is possible to breed some easy corals like Soft ones, and maybe also some LPS. 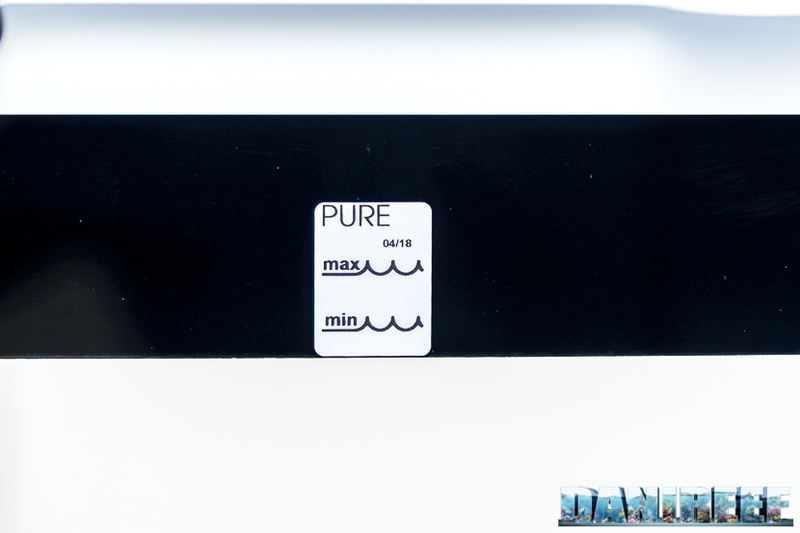 Pure Marine is a marine aquarium sui generis. We know that for the successful breeding of small polyp scleractinians, or SPS, e.g. Acroporas, a protein skimmer is required. 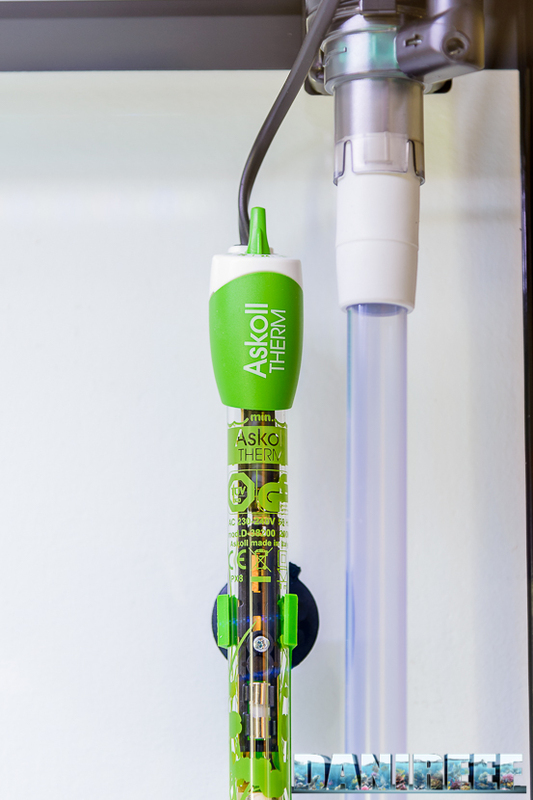 For reasons of place and design, Askoll decided not to include a skimmer in this aquarium, so the filter is based on a surplus of mechanical and biological filtration. 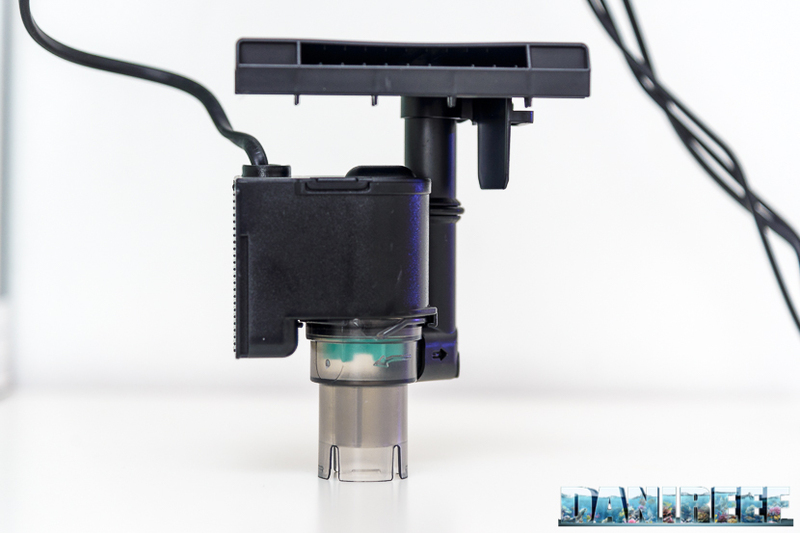 The pump draws water from the tank and pushes it through the compartments you can see above. The pump is on the right side. 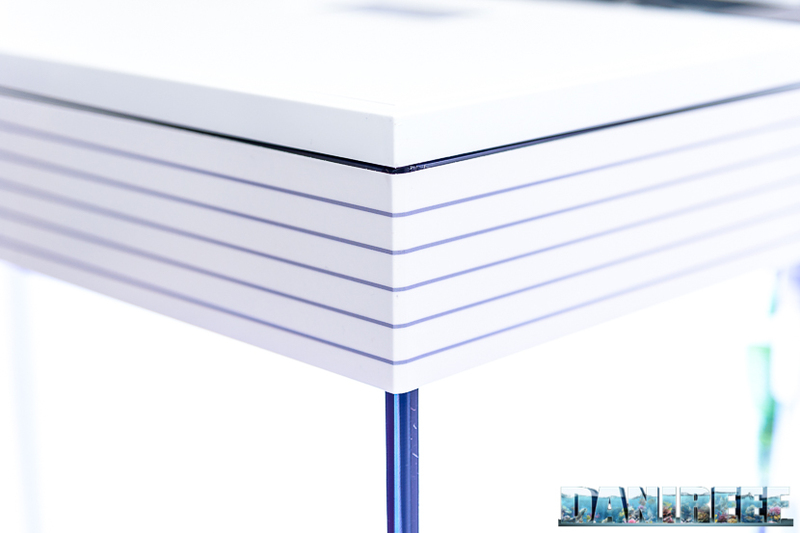 First, water passes through 3 compartments with a mechanicalfiltration to remove the suspended particles. Next, it goes through a chemical filtration zone with activated carbon. From here, part of the water returns to the tank, the rest passes through a second area, on the left in the picture, where it finds biological media and zeolite. The system is very well engineered, because it is out of sight, hidden in the top. Furthermore, the part of water returning to the tank will provide oxygenation for the aquarium. 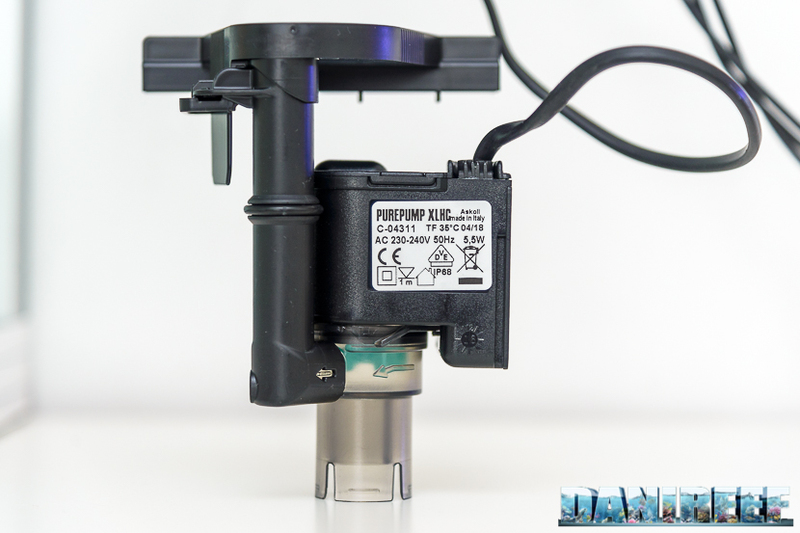 The pump provided with the new Askoll Pure Marine XL is an Askoll pump as well, called PurePump XLHC. 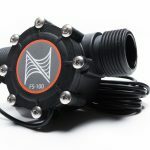 The pump has a declared consumption of 5.5 watt and a flow of 800 l/h, which means, according to Askoll, that it provides 370 l/h of filtration. We notice how serious Askoll is from this detail, giving the real flow of the filter and not just declaring the pump flow. Keeping 5.5 watts permanently in use means a medium power consumption of 5.5 x 24 x 30=4kwh per month, which translates to 48kwh per year. 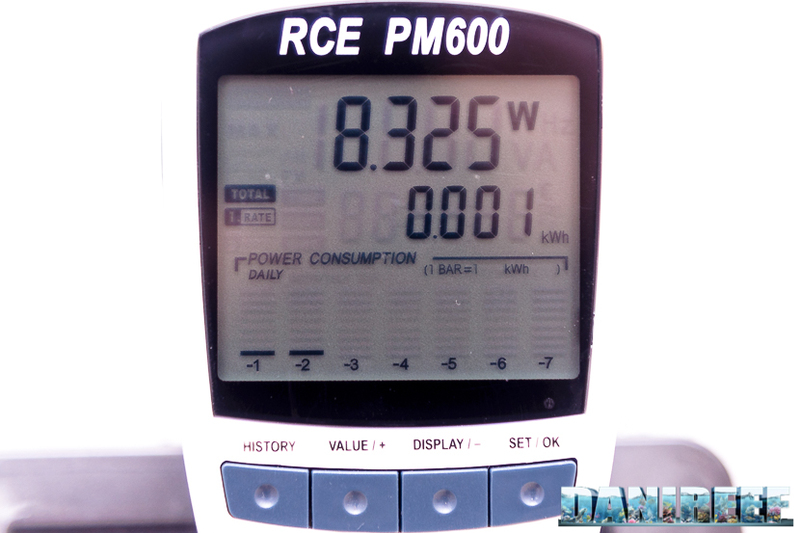 At present time, one kwh costs about 0.27 euro, so the filter consumption per year would be the paltry sum of 13 euro, little more than one euro (approximately $1.15 USD) per month. 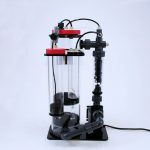 We wanted to test the pump, as we usually do, with flow and heading measure, but the pump is built into the filter, so we were not able to do that. Talking about power consumption, lighting takes central stage compared to the filter. With a photoperiod of 12 hours, of which 7.5 are at full power, we are talking about 8 x 27+11.5 x 8.3=311.45 watts per day, or 311.45 x 365=114kwh per year, which means, multiplied by 0.27, a cost of 31 euros per year, a little less than 2.5 euros per month (approximately $2.85 USD). 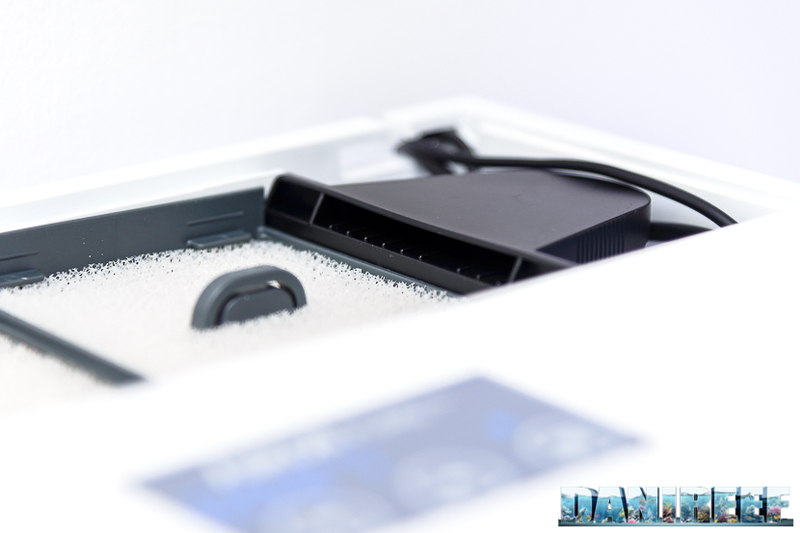 Inside the Askoll Pure Marine aquarium, a 200 watt heater is provided, as we can see in the following picture. It works quite simply, you just need to set the correct temperature by turning the upper knob. The heater is very nicely sized for a tank like this, so you won’t have any problem. The running hours depend on the room temperature of the tank. 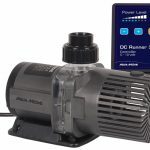 Since the lights by themselves have a consumption of 311 watts per day, the heater in just one and a half hours would spend the same energy as the lights, becoming the first consumption source of the aquarium. By the way, considering the size we are talking about, this is still a very small amount, unless you keep the tank in an unheated room, which is definitely not recommended. 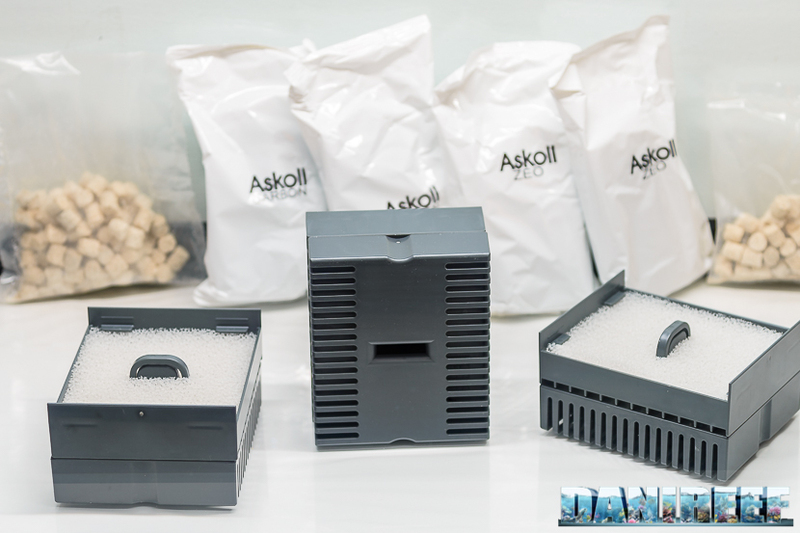 When we talk about Askoll we cannot fail to notice the details that make the difference between an ordinary aquarium and an aquarium thought to perform at best its function. Below we can appreciate the place for the filter, heater, and lighting cables, very neat and hidden away. Just outside the tank, the three cables can be linked by a black zip-tie, so everything looks neater. Inside the top we can check the water level. 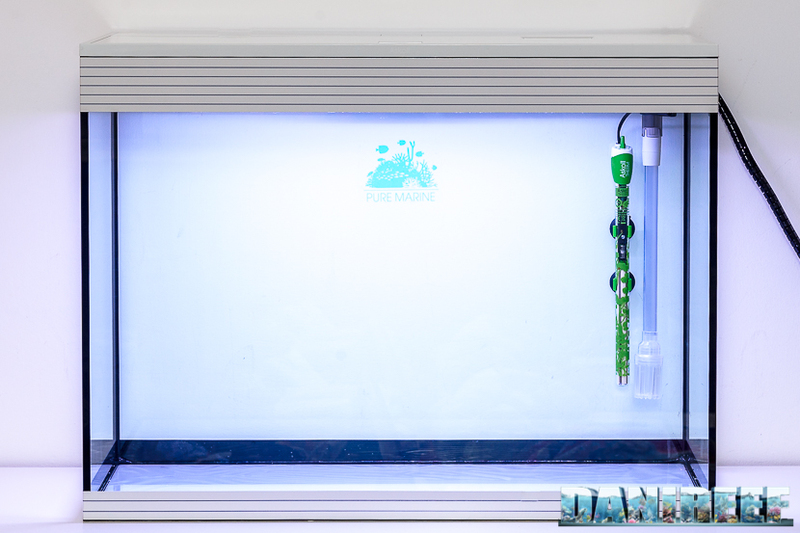 I would sincerely recommend using a top-off system for evaporated water, since keeping a steady salinity of 35 per thousand is essential for a healthy aquarium. Otherwise you have to be extremely diligent with frequent top-offs, to prevent salinity fluctuations. What can we breed within? Remember that we are talking about an aquarium without a protein skimmer, so the kind of corals that can breed in this tank will be limited. We cannot breed small-polyps-scleractinians, but I think that there wouldn’t be any problem with fish and soft corals, as long as we follow certain rules. Long-polyp-scleractinians are in the middle. If you are careful and meticulous, you could be successful. 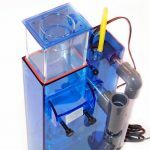 We already said that this aquarium does not have a skimmer, so we have to depend on a well-functioning biological removal and continuous chemical action. It might be interesting to run this tank with a DSB (Deep Sand Bed, more information here), which means filling it with about 13 cm of sand, that after a long maturing will become the real filter of the system, helped by about 8-10 kg of live rock. If you don’t want to go down this road, we suggest adding about 18 kgs of live rock, which is 1 kg for every 7 liters of aquarium volume. Live rock will take care of the treatment of the biological load of the aquarium. 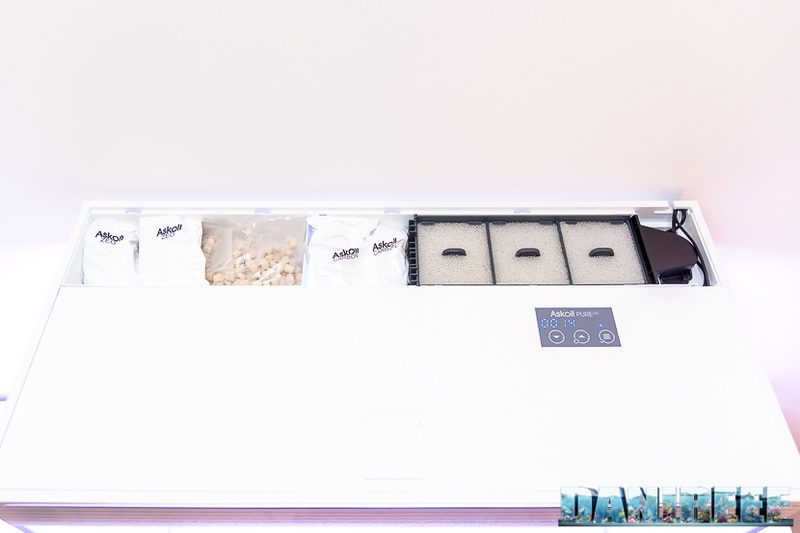 From the chemical point of view, in this kind of aquarium, a generous filtration with activated carbon and zeolite is crucial. 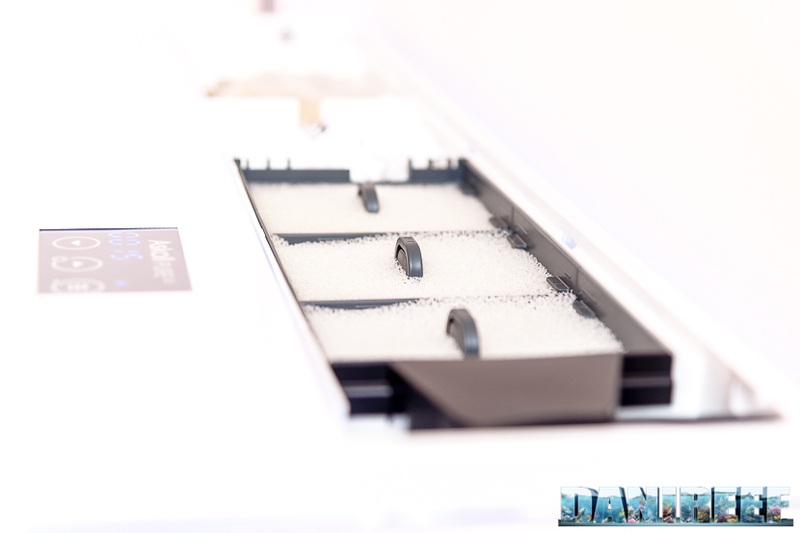 The first one will keep your water clear and neutralizes any compounds issued by the corals. The second one will help facilitate a quick disposal of ammonia, which means less nitrates at the end of the nitrogen cycle. Regardless, the tank will have a nitrate surplus, because of the lack of skimmer, so a weekly 10% or 20% water change is strongly recommended if you want to breed any corals more demanding than the soft ones. 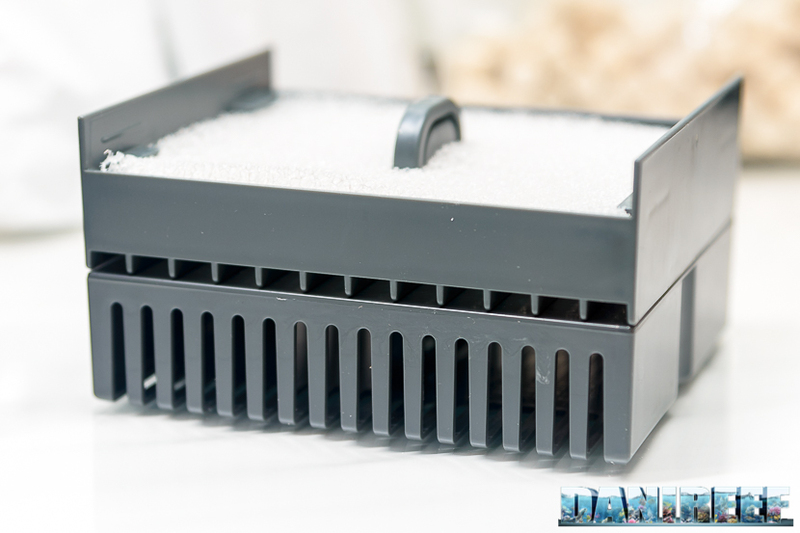 Mechanical filtering sponges must be cleaned very often (every 2-3 days) and changed monthly using Pure Filter Media Kit, or, if used together with live rock or a DSB, use them only a few days a month, just in case of suspended materials in the water. We don’t have a public price, but we can give you a rough idea of the price: between 350 and 400 euros ($398 and $455 USD). It’s a good price, given what it includes. The aquarium is complete and technically it only needs a couple of moving pumps. The pumps should be chosen according to what we want to breed within the tank. As a general rule, I say that for a fish and soft coral tank, you need two pumps of 5 times the tank’s volume, which means about 650 l/h each, while in case of LPS we should increase up to 1,350 l/h. So the price is, according to us, very reasonable when considering the technology included with the tank.